Removes the delay disadvantages of electronic gas pedals so your engine can respond faster. 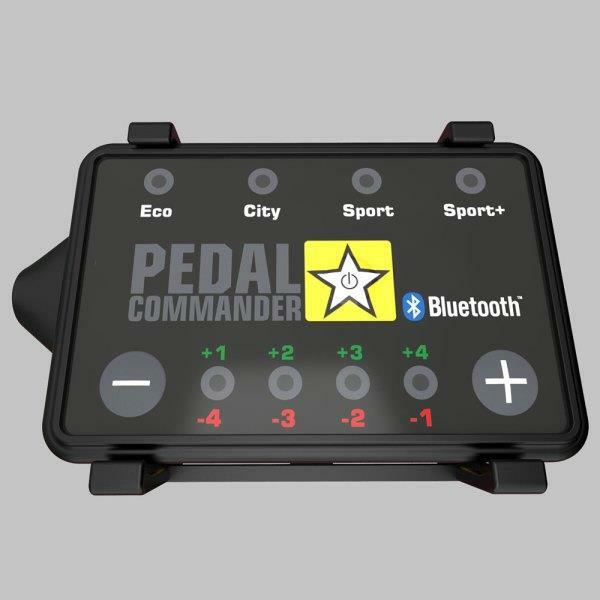 Pedal Commander is not a generic one-size-fits-all device. Each unit is individually programmed according to the make, model, engine specs and transmission of your car. Pedal Commander system comes with 4 different modes: Eco, City, Sport and Sport+. Each mode has 8 adjustable settings. Pedal Commander’s hardware is top-quality. We guarantee it with a two-year defect warranty in the form of a product replacement. After a short and easy install, you will notice greatly increased engine response, faster acceleration or save fuel up to 20% with real ECO Mode! Simply put, more pleasure driving. OEM Factory Harness & Easy Do-It-Yourself Installation within 10 Minutes. Your satisfaction is our top priority. We offer a 30-day money back guarantee, no questions asked. All automotive components are high-grade, such as 3M keypad, high performance CPUs for real-time calculations, and original connectors in OEM quality.